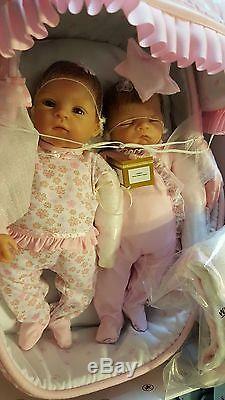 LULLABY TWINS WITH BASSINET , incredibly lifelike twin baby dolls by artist Waltraud Hanl. One precious baby is a miracle, but what a special miracle, indeed, when they come in pairs! Meet Heather and Hannah from the Lullaby Twins Baby Doll Set by Master Doll Artist Waltraud Hanl and a Signature Edition available exclusively from The Ashton-Drake Galleries in a strict limited edition of 5,000 sets worldwide! These So Truly Real® lifelike twin baby girl dolls are handcrafted in our exclusive RealTouch® artisan vinyl for the ultimate in realism. This collector-quality material will amaze you, because it feels just like a newborn's smooth skin - so soft that it creates supple hands that you can fold gently into your own and touchable toes that you can wiggle as you count them. Run your finger along their delicately blushed cheeks and feel their velvety softness. Touch their wispy hair and marvel at the long eyelashes as soft as a butterfly kiss. Only an award-winning talent like Ms.
Hanl could rise to the challenge of sculpting not one but two lifelike twin baby girls who look so much alike, and yet are loaded with individual charm. 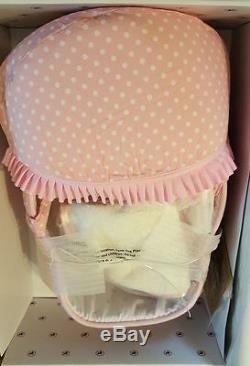 Each 14-inch baby doll is nestled together in their Moses basket-style bassinet covered with pink polka-dot fabric on the outside and lined with a coordinating pattern on the inside. The bassinet even has a mattress pad, soft, pink-trimmed pillow to rest their heads and a plush blanket to keep them oh-so comfy and warm. The ruffled basket hood can be removed if you like, but the twins will love it when you push the button on the back of the dangling star and it plays the soothing lullaby "Rock-a-Bye Baby". While it's traditional to dress twins alike, we've chosen to salute their individual natures with soft sleepers that coordinate so sweetly together. Sleeping Heather wears a ruffled pink, footed pajama with floral cuffs and Hannah's outfit has a floral fabric with pink accents. They both wear matching pink hair ornaments - how cute! As a Signature Edition doll set, each of the Lullaby Twins will be given a special doll stamp discreetly etched into the doll's neckline mold along with a costume tag. Our Signature Edition golden logo tag is stitched onto the bassinet. Dolls measure approximately 14 (35.6 cm) Long. Bassinet is approximately 18 (45.7 cm) Long. Brand new in the box. My name is Rachel, My firs priority is to provide excellent quality products and customer service. I'm absolutely committed to honesty and integrity with everyone we come into contact with me. Please contact me if you have any questions and I will be happy to answer any that you may have. The item "ASHTON DRAKE LULLABY TWINS BABY DOLLS WITH BASSINET BY WALTRAUD HANL" is in sale since Saturday, June 25, 2016. This item is in the category "Dolls & Bears\Dolls\By Brand, Company, Character\Ashton Drake\So Truly Real". The seller is "bebepourlavie" and is located in Beauharnois, Quebec. This item can be shipped to Canada, to United States.